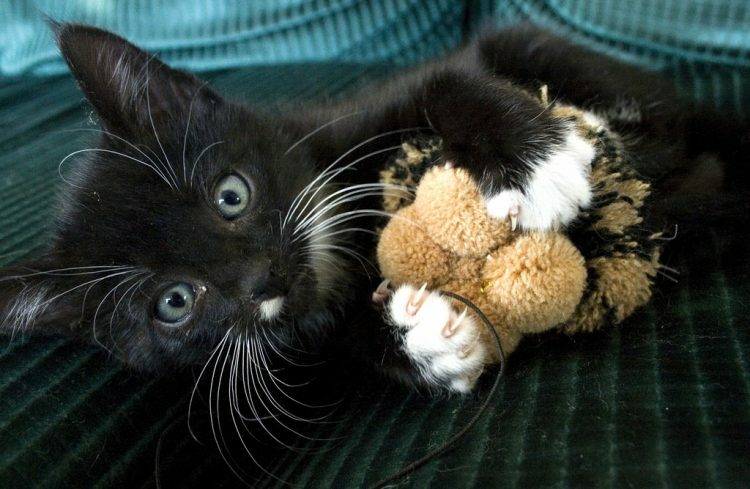 Kittens learn a lot through playing, and the fun continues when they become adults. Thor strolled into Shammy’s room and stopped — he had just spotted the new catnip toy I’d given our guest cat. Never mind that there was an almost identical toy downstairs. He had played with that one already. So Thor trotted over to the coveted toy and started playing with it. Shammy froze, eyes wide with concern. After all, it was his toy. Thor felt Shammy’s eyes on him and stretched out, covering the toy completely with his large gray body. “No catnip toy here,” Thor’s green eyes telegraphed. Desperate, Shammy pushed a nearby ball around, as if to say, “Hey, see how cool this one is? It moves.” Thor didn’t budge. It was like watching a couple of kids squabbling over a toy. Was it possible, I wondered, that the feline idea of play was closer to ours than I’d realized? This includes roughhousing with litter mates as well as with other pets and you. Kittens begin play-fighting at roughly 4 weeks old with mom refereeing and sometimes joining in. They develop paw-eye coordination, and they learn to keep their baby fangs and claws in check. The interactive play period supposedly tapers off between 9 and 16 weeks. I’ve handled litters where this wasn’t the case, however: The longer the siblings stayed together, the longer this particular period lasted. And when the kittens went to their forever homes, they simply made new playmates of the cats they found there. This means playing with toys or anything that can be rolled, clawed or batted off a bureau. Topaz, our Siamese, was fascinated by pens, wrapping his paw around whichever one I was using. He also had a yellow ball that he faithfully carried around and played with until it finally fell apart. Obviously, these last 2 categories overlap. Perhaps we are better off using the terms “solitary play” and “social play,” remembering that nothing is clear-cut when it comes to cats. Sometimes a cat in search of amusement can come up with some decidedly quirky solutions. Keisha, our dilute tortie, used to bring acorns in from the cat enclosure and bat them under the stove. Eilonwy, a Somali rescue who came through here a few summers ago, fancied pipe cleaners. And my sister-in-law was mortified when she moved a chair and found out that their cat Gloves had been stockpiling some unusual toys of her own — tampon cases. This doesn’t mean you shouldn’t go out and buy toys for your cats. 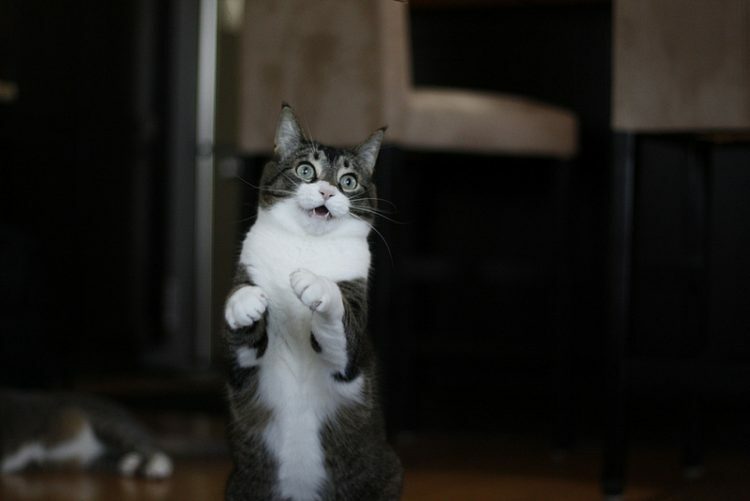 It just shows that cats see the possibilities in all things and are good at playing pretend games. So are cats like us when it comes to playing? The answer is yes and no. Yes, many of their kitten moves do become hunting and fighting movements later. But I’ve seen my cats jump at windows and doors, entranced by the autumn leaves whirling about outside; I watched my old man Hawkeye suddenly do an exuberant Riverdance-style leap into the air for no reason — and it’s clear how much they, like human children, live in the moment. And that’s what play is about.